From the moment we knew of his existence, he was the most eagerly-awaited celebrity baby of 2011. How could he not be, with the parents that he had? Miranda Kerr was our country town girl made good due to her girl-next-door dimpled beauty. A supermodel who wore undies and flogged face cream for a living, and also managed to be intelligent, politically caring and spiritually aware, she won hearts with her down-to-earth personality. Last June she became engaged to Orlando Bloom, a good-looking English movie star who shares her Buddhist ideals and has vague ties with Australia, which seemed eminently suitable. They married with suspicious haste only a month later, provoking much speculation that the couple were already expecting a baby. By August, it was confirmed that Miranda was pregnant and due in a few months. Baby name obsessives were soon feverishly wondering what name they would choose for it. Would it be an Australian name? An English name? A Hollywood name? A fashion name? A Buddhist name? Or would it be something romantic, literary and Latinate like Miranda and Orlando’s own names? We all awaited the presence of Johnny Sparrow Legolas or Lotus Pearl Victoria with bated breath. Baby Bloom entered the world on January 6 2011 and it was a boy! It was a natural birth, and Miranda endeared herself to the female public further by saying that giving birth to a 10 pound baby without drugs is an extremely painful, protracted and difficult process. This was refreshing after uber-model Gisele Bündchen’s smug and unconvincing claim that natural birth “didn’t hurt in the slightest” (cue 99% of mothers all foaming at the mouth simultaneously). We waited to hear what name they had chosen for him … and waited … and waited. Miranda’s mum explained that they had a long list of names and were still trying to decide which one to use. Even in the midst of our impatience, it seemed touching that despite their beauty, wealth, fame and spiritual enlightenment, the Blooms had the same “heck the baby’s arrived and we still don’t know what to call him” issues shared by many other couples. 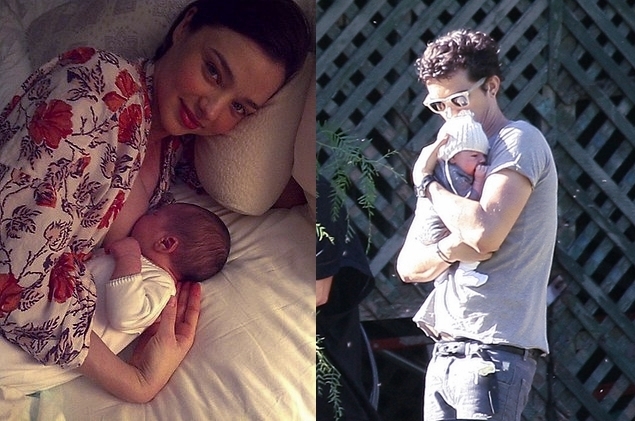 On January 19, Miranda revealed the baby’s name to be Flynn on her blog. It was a name that was Australian and Hollywood and fashion world, for it is the surname of Australian actor Erroll Flynn – the star of 1930s/40s swashbuckling derring-do flicks very much like the Pirates of the Caribbean movies that Orlando himself has starred in. Erroll Flynn was born in Tasmania, the state in which Orlando Bloom’s maternal grandparents lived at one time. In addition, another Australian supermodel, Elle McPherson, has named one of her sons Arpad Flynn Alexander. Just possibly, he was named after a more recent Hollywood connection – Flynn Rider is the (assumed) name of the handsome prince in the Disney animated musical Tangled, which came out about six weeks before Flynn Bloom’s birth. There has been a recent fad for naming girl babies after Disney princesses – could the Blooms be the start of a new trend for calling boys after Disney princes? The names of the other Disney princes are Ferdinand, Charming, Philip, Eric, Aladdin, John, Shang and Naveen – hmm, maybe it’s the start of a new trend of Disney providing prince names we may actually want to use! Mind you, Flynn Rider’s real name is Eugene – perhaps the Disney princes could all start choosing cool fake names for themselves. It was only a couple of weeks ago that Flynn Bloom’s middle name became known: Christopher. Miranda explained on Facebook that they had chosen his middle name to honour her first boyfriend, who had been killed in a car accident when he was still a teenager. Many people will say that naming a baby in honour of an ex is absolutely not on, but I think this is really touching, and clearly Orlando Bloom is far too mature and secure to worry about his son sharing a name with his wife’s dead ex. I must confess to having a great affection for the name Flynn, which I think is simple, cute and spunky. It’s also just dropped off the Top 100 in Australia, and Miranda and Orlando’s choice could very well bring it back up there again. However, I’m not sure it really goes that well with the surname Bloom. Both names are one syllable and end with a N/M sound, so they are a little too similar to mesh well, in my opinion. Also, to me the name sounds as if it is saying “in bloom” – although I can’t decide is that is a problem or not! Being in bloom is such a positive thing, after all. From polling and surveying people at a couple of sites, I get the impression most people think that Flynn Bloom is a bit too short and abrupt, and share my concerns about the awkwardness of the full name, although in general they liked the name Flynn itself. Overall, I give Flynn Christopher Bloom a thumbs up and a warm welcome to the world. You’re in like Flynn, Baby Bloom! Thats a really awesome name! I find I like it more and more as time goes on – I think they did a great job!